In this brand new 3D design competition, we've teamed up with WildBrain to bring you something completely different! WildBrain operate a multi-platform kids video network and produce original content for YouTube, working with companies to make exciting early learning animations for children. The team at WildBrain manage hundreds of popular brands on YouTube, including Teletubbies, Caillou, Johnny Test, In the Night Garden, Twirlywoos and many more. 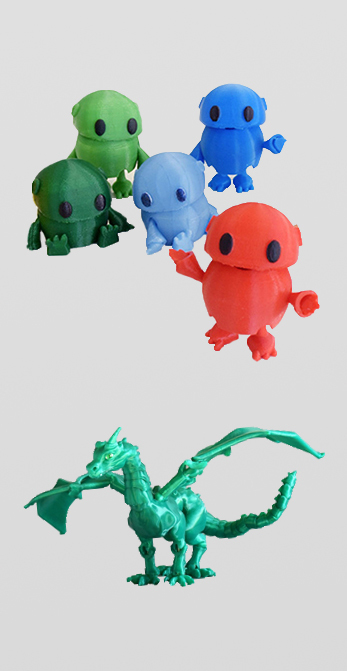 Now, WildBrain is looking to the MyMiniFactory community to come up with brilliant new early learning characters! We want to you to use your 3D design skills to create a new character, or group of characters, that could be used as the stars of a new WildBrain production. Your characters will need to be 3D printable, as they will be bought to life both on and off screen. The characters you create need to be suitable for an early learning show, targeted at children aged 3-5 years, so think simple, colourful and exciting. The winning design will walk away with $500, as well as the amazing opportunity to have your work featured in an original children's animation created and produced by WildBrain. Please make sure to read the full rules here before entering. Good luck! Please note: this competition is only open to participants from the US, Canada and the UK. Based on response WildBrain will look to open this to the rest of the world in future. The winner will receive $500! Step 1Who is your target age group amongst the early learning community. Step 2Explore our characters on the WildBrain channel and see what makes them attractive to children. Step 3Think about the existing characters you like and what makes them stand out. Step 4How can your character(s) be an educational instrument for young children? - NO PURCHASE OR PAYMENT OF ANY KIND IS NECESSARY TO ENTER OR WIN THIS CONTEST. - THIS IS A SKILL-BASED CONTEST. - VOID WHERE PROHIBITED BY LAW. - AFFIDAVIT OF ELIGIBILITY / RELEASE OF LIABILITY / PRIZE ACCEPTANCE AGREEMENT MAY BE REQUIRED. - ALL DISPUTES WILL BE RESOLVED SOLELY BY BINDING ARBITRATION AND ENTRANTS WAIVE THE ABILITY TO BRING CLAIMS IN A CLASS ACTION FORMAT. - SPONSOR OBTAINS RIGHTS FROM ENTRANTS TO POST AND USE ANY AND ALL CONTENT SUBMITTED AS PART OF THE CONTEST. - ONLINE ENTRY ONLY AND INTERNET CONNECTION REQUIRED. - THIS CONTEST IS IN NO WAY SPONSORED, ENDORSED, ADMINISTERED BY, OR ASSOCIATED WITH FACEBOOK, INC. (“FACEBOOK”), INSTAGRAM, LLC, (“INSTAGRAM”), OR TWITTER, INC. (“TWITTER”). BY ENTERING (OR OTHERWISE PARTICIPATING) IN THE CONTEST, ENTRANTS AGREE TO THESE OFFICIAL RULES, WHICH CREATE A BINDING CONTRACT SO READ THEM CAREFULLY BEFORE ENTERING. WITHOUT LIMITATION, SUCH CONTRACT INCLUDES GRANTS OF RIGHTS AND INDEMNITIES TO THE CONTEST ENTITIES FROM YOU AND A LIMITATION OF YOUR RIGHTS AND REMEDIES. 1. Eligibility. The WILD BRAIN 3D Printing Contest (the “Contest”) is open only to individuals who are legal residents and physically located in the United Kingdom, Canada (excluding Quebec), or one (1) of the fifty (50) states in the United States or the District of Columbia and who are at least the age of majority at the time of entry. Myminifactory.com (“Administrator”), is administering certain aspects of this Sweepstakes on behalf of the Sponsor. Employees, officers and directors of Wild Brain Family International Limited (“Sponsor”, “us” or “we”), its parent, and each of their respective affiliates, subsidiaries, advertising and promotion agencies, distributors and other prize suppliers and Administrator (collectively, the “Contest Entities”), and each of such employees’, officers’ and directors’ immediate family members and/or those living in the same household (whether legally related or not) are not eligible to enter the Contest or win a prize. For purposes of this Contest, immediate family members are defined as spouse, partner, parents, legal guardians, in-laws, grandparents, siblings, children and grandchildren and those living in the same household shall mean people who share the same residence at least three (3) months a year, whether legally related or not. Void where prohibited by law. By entering or participating in the Contest, entrants agree to be bound by these “Official Rules” and the decisions of the Judges (defined below) and/or Sponsor, which are binding and final on matters relating to this Contest, including, without limitation, interpretation of the Official Rules. 2. Entry Period. The Contest begins on or about 12:00 p.m. Greenwich Mean Time on December 12, 2016 and all entries must be received by the Sponsor on or before 11:59 p.m. Greenwich Mean Time on January 9, 2017 (the “Entry Period”). 3. How to Enter. To enter the Contest, during the Entry Period, visit the Contest application site at https://www.myminifactory.com/competition/104 (the “Contest Application Site”) or otherwise follow the call to action provided in any advertising for the Contest. The Contest Application Site will contain a description of the Contest and the official entry form. Each entrant will be asked to submit an official entry form, which may include, among other things, his/her full name, address (no P.O. Boxes), email address, gender, date of birth and related registration information as prompted. Additionally, entrants must submit one (1) to three (3) character designs (“Character Designs”) with a written description of the Character Designs not to exceed three hundred (300) words (“Description”) (the Character Designs and Essay are collectively a “Submission”). For purposes of this Contest, a Submission is comprised of the Character Designs and Description that follows the technical, creative, and legal requirements disclosed on the Contest Application Site and elsewhere in these Official Rules, including, without limitation, the Content Guidelines (defined below). Limit of five (5) entries per person/email address for the Contest, provided that each entry must not contain a Submission that has been submitted, in whole or in part, in a previous entry for this Contest. Any attempt by the same entrant to submit the same Submission more than once may result in the entrant being disqualified. A Submission may, in Sponsor’s sole and absolute discretion, be rejected if it fails to follow the technical, creative, and legal requirements disclosed on the Contest Application Site and in these Official Rules. The database clock of the Contest Application Site will be the official timekeeper for the Contest. Those who do not follow all of the instructions, provide the required information in their entry form, or abide by these Official Rules or other instructions of Sponsor may be disqualified at Sponsor’s sole and absolute discretion. All entries that are late, illegible, incomplete, damaged, destroyed, forged or otherwise not in compliance with the Official Rules may be disqualified from the Contest at Sponsor’s sole and absolute discretion. Entries generated by script, macro or other automated means and entries by any means which subvert the entry process are void. All entries become the physical property of Sponsor and will not be acknowledged or returned. Assurance of delivery of entries is the sole responsibility of the entrant. In the event of a dispute as to the identity of any entrant who submits an entry, the entry will be deemed submitted by the account holder of the email or other account (e.g., Facebook) from which it was sent but only if such person is otherwise eligible. The “account holder” is the person assigned an email address or username by the entity responsible for assigning it (e.g., Google). Winner(s) (defined below) may be required to show proof of being the registered account holder. If a dispute cannot be resolved to the Sponsor’s satisfaction, the entry will be deemed ineligible. Sponsor and affiliated entities are not responsible for lost, misdirected, misplaced, stolen, tampered with, deleted, or invalid entries. Submissions should not reveal any personal information about another individual, including another person’s address, phone number, email address, credit card number or any information that may be used to track, contact or impersonate that individual. 5. Intellectual Property. Entrant, upon submission of his or her Submission to the Contest, irrevocably grant to Sponsor, and each of its licensees, successors and assigns, the non-exclusive, perpetual, royalty-free, no-cost license and right to use and otherwise exploit the Submissions, and all images, text and materials included or depicted therein, in whole or in part, in any manner or medium now or hereafter known or devised throughout the universe and in any and all languages, including, without limitation, the right to display, reproduce, recreate, record, perform, exhibit, distribute, copy, edit, change, modify, add to, subtract from, re-title and adapt the same, to combine it with other material and otherwise use and exploit it without having to give any compensation or attribution to entrants or any third party, except for the awarding of the prize to the Winner in this Contest. Sponsor, and each of its successors, assigns and licensees, will have the right to make unlimited derivative works of Submissions for marketing, promotion or any other non-commercial purpose, to assign or transfer any or all of Sponsor’s granted rights and to grant unlimited, multiple-level sublicenses. Without limiting the forgoing, Sponsor will have the right to use the Submissions submitted as part of the Contest, and all images, text and materials included or depicted therein (if any), in any advertising, marketing, promotion or for any other non-commercial purpose. Entrants hereby forever waive and relinquish all “moral rights (droit moral)” now or hereafter recognized in connection with Submissions submitted as part of the Contest. Entrants must maintain the ability to license all such rights to Sponsor free of any limitations, restrictions or third party obligations. Entrants agree that Sponsor shall have the sole discretion in determining the extent and manner of use of Submissions and are not obligated to use any Submission. Entrants agree that Contest Entities shall not be responsible for return or preservation of the Submissions submitted. All Submissions that are posted on the Contest Application Site or elsewhere are available to be viewed by anyone with access to the Internet. Each entrant acknowledges that Submissions are not being submitted in confidence or in trust to Sponsor and that no confidential or fiduciary relationship is intended or created. Each entrant acknowledges that Sponsor and other entrants may have created ideas and concepts contained in their Submissions that may have familiarities or similarities to his/her own Submission, and that he/she will not be entitled to any compensation or right to negotiate with the Contest Entities because of these familiarities or similarities. Notwithstanding any custom and practice in the industry to pay an individual for an idea (if any), nothing herein shall create an implied or express contract to compensate entrants for their Submissions and there is no obligation for Contest Entities to pay or otherwise compensate entrants for any of their ideas or materials in any communications with Sponsor, whatsoever. Submissions are not confidential and the only obligations of the Contest Entities to entrants regarding Submissions are as specifically set forth in these Official Rules. The decisions of the Sponsor are final and binding in all matters relating to this Contest, including interpretation and application of these Official Rules. Entrant, by participating in the Contest, except where legally prohibited, grants permission for Sponsor and its designees to use his/her name, address (city and state), photograph, voice and/or other likeness and prize information for advertising, trade and promotional purposes without further compensation, in all media now known or hereafter discovered, worldwide in perpetuity, without notice or review or approval. Sponsor reserves the right to request from entrant at any time proof that entrant maintains all necessary rights in their Submission in order to grant Sponsor the rights required herein in a form acceptable to Sponsor. Failure to provide such proof may lead to, among other things, the entrant being disqualified from the Contest. 6. Representations, Warranties and Indemnity. By entering the Contest, entrant represents and warrants that he or she has read, understands, agrees to and will follow the Official Rules. Entrant further represents and warrants that his or her Submission and all materials and matter therein: (a) (except for elements that are within the public domain or are provided by Sponsor for inclusion in Submissions) are wholly original with such entrant and are not a copy or imitation of any other material or entrant has all necessary rights to grant the Sponsor the rights granted hereunder and exercise such without obligation or liability to any third party; (b) will not infringe or violate any right whatsoever, including, without limitation, any personal rights (e.g., defamation, privacy, false light, moral right, etc.) or any property rights (e.g., copyright, trademark, right to ideas, etc.) of any person or entity and the use thereof will result in no third party liability or obligations; and (c) is not the subject of any threatened or pending litigation, claim or dispute that might give rise to litigation, which adversely affects or in any way prejudices, impairs or diminishes the rights granted hereunder or the value thereof. Entrant further represents and warrants that he or she has the right to agree to and fully perform consistent with these Official Rules and that he or she has complied and has obtained all permissions, licenses and consents that are necessary for the submission of the Submission and the use of the Submission and to verify compliance with the foregoing requirements. Entrant agrees to provide to Sponsor at Sponsor’s request copies of all such permissions, licenses and consents. Sponsor reserves the right, in its sole discretion, to disqualify and/or not to post on the Contest Site any Submission that Sponsor determines does not comply with these Official Rules, to make such changes to any Submission as are necessary to make it compliant, or to require the entrant to do so. Entrant further acknowledges and agrees that he/she has not previously granted, assigned or otherwise encumbered his/her Submission, or any images, text and materials depicted therein, to any other third party. Further, entrant represents and warrants that Sponsor’s use of any Submission, including any images, text and materials depicted therein, shall not violate an agreement to which such entrant has signed. Entrant agrees to indemnify and hold the Released Parties (defined below) harmless from and against any third party claims, to the extent arising out of or relating to any breach of any representation, warranty or covenant made by entrant in connection with his or her acceptance of these Official Rules or Contest activities. 7. Determining the Winner(s). After the conclusion of the Entry Period, each Submission will be reviewed by a team of judges (the “Judges”) assembled by Sponsor, who will review and judge all eligible Submissions based on the following judging criteria (collectively, the “Judging Criteria”): creativity, originality, appeal to a pre-school audience and promotion of educational values to a pre-school audience. Judges will score each element of the Judging Criteria from 1 to 5 (5 being the highest). Based on the total score the Judges assign to each Submission using the Judging Criteria, one (1) winning Submission will be ultimately selected by the Judges (“Winner”), subject to confirmation that the potential Winner has met the eligibility requirements and complied with these Official Rules. If there is a tie after the Judges apply the Judging Criteria, Sponsor will bring in a tie breaking Judge to apply the same Judging Criteria to break the tie and determine the Winner. 8. Winner Notification. The potential Winner will be notified by email, phone and/or other method (as selected by Sponsor) on or about February 6, 2017. The Sponsor is not responsible for false, incorrect, changed, incomplete or illegible contact information. Notification is deemed to have occurred immediately upon sending of an email. The potential Winner will be required to execute and return an affidavit of eligibility, a liability release, a publicity release and the license agreement (collectively, “Prize Acceptance Documents”) within seven (7) days of date of issuance. If such documents are not returned within the specified time period, a prize or prize notification is returned as undeliverable, Sponsor is unable to contact a potential Winner or a potential Winner is not in compliance with these Official Rules, the prize will be forfeited and, at Sponsor’s discretion, an alternate winner will be selected. Parents or legal guardians of a winner under the age of majority in his/her state of residence may be required to also sign the Prize Acceptance Documents in order for the Winner to be qualified to receive his/her prize. Non-compliance shall result in disqualification and award of the prize to an alternate winner. If any potential Winner is found to be ineligible, or if he or she has not complied with these Official Rules, or declines a prize for any reason prior to award, such potential Winner may be disqualified and an alternate potential winner may be selected. The Sponsor is not responsible for and shall not be liable for late, lost, damaged, intercepted, misdirected, or unsuccessful efforts to notify the potential Winner. 9. Prize and Value. The prize to be awarded in this Contest is Five Hundred United States Dollars ($500.00 USD). The prize is non-transferable, with no equivalents or substitutions except at Sponsor’s sole and absolute discretion. All prize details not specified in these Official Rules will be determined in Sponsor’s sole and absolute discretion. In the event a Winner (and/or his or her companion(s) (if applicable)) engage in behavior that (as determined by Sponsor in its sole and absolute discretion) is obnoxious, inappropriate, or threatening, illegal or that is intended to annoy, abuse, threaten or harass any other person, Sponsor reserves the right to terminate the right to receive a prize. Prize Winner will be solely responsible for all federal, state, local and/or provincial taxes, and for any other fees or costs associated with the prize they receive, regardless of whether they, in whole or in part, are used. The Winner may be required to provide Sponsor with a valid social security number (if Winner is residing in the U.S.) before the prize will be awarded for tax reporting purposes. An IRS Form 1099 may be issued in the name of Winner for the actual value of the prize received. An unclaimed prize will be forfeited. 10. General Conditions. Released Parties (as defined below) are not responsible for lost, late, incomplete, inaccurate, stolen, misdirected, undelivered, delayed, garbled or damaged entries; or for lost, interrupted or unavailable network, server, Internet Service Provider (ISP), website, or other connections, availability or accessibility or miscommunications or failed computer, satellite, telephone or cable transmissions, lines, or technical failure or jumbled, scrambled, delayed, or misdirected transmissions or computer hardware or software malfunctions, failures or difficulties, or other errors or difficulties of any kind whether human, mechanical, electronic, computer, network, typographical, printing or otherwise relating to or in connection with the Contest, including, without limitation, errors or difficulties which may occur in connection with the administration of the Contest, the processing of entries, the announcement of the prizes or in any Contest-related materials. Released Parties are also not responsible for any incorrect or inaccurate information, whether caused by Contest Application Site users, tampering, hacking, or by any equipment or programming associated with or utilized in the Contest. Released Parties are not responsible for injury or damage to participants’ or to any other person’s computer related to or resulting from participating in this Contest or downloading materials from or use of the Contest Application Site. Persons who tamper with or abuse any aspect of the Contest or Contest Application Site or who are in violation of these Official Rules, as solely determined by Sponsor, may be disqualified and all associated entries voided, all in Sponsor’s sole judgment. Should any portion of the Contest be, in Sponsor’s sole opinion, compromised by virus, worms, bugs, non-authorized human intervention or other causes which, in the sole opinion of the Sponsor, corrupt or impair the administration, security, fairness or proper play, or submission of entries, or should the Contest be unable to run as planned for any other reason, Sponsor reserves the right, in its sole discretion to suspend, modify or terminate the Contest and, if terminated, at its discretion, select the potential Winner from all eligible, non-suspect entries received prior to the action taken or as otherwise deemed fair and appropriate by Sponsor. The Released Parties are not responsible for electronic communications that are undeliverable as a result of any form of active or passive filtering of any kind, or insufficient space in entrant’s email or other account to receive messages. CAUTION: ANY ATTEMPT TO DAMAGE THE CONTEST APPLICATION OR UNDERMINE THE LEGITIMATE OPERATION OF THE CONTEST IS A VIOLATION OF CRIMINAL AND CIVIL LAWS AND SHOULD SUCH AN ATTEMPT BE MADE, SPONSOR MAY DISQUALIFY ANY SUCH INDIVIDUAL AND RESERVES THE RIGHT TO SEEK DAMAGES (INCLUDING ATTORNEYS’ FEES) AND OTHER REMEDIES FROM ANY SUCH INDIVIDUAL TO THE FULLEST EXTENT PERMITTED BY LAW. 11. Release. By participating in the Contest, entrant agrees to release, discharge and hold harmless the Contest Entities and Facebook, Twitter and Instagram, and each of their respective directors, officers, employees, agents, successors and assigns (“Released Parties”), from and against and any and all claims, liability, costs, losses, damages or injuries of any kind arising out of or related to entrant’s participation in the Contest and/or related to any prize (including, without limitation, losses, damages or injuries to entrant’s or any other person’s equipment or other property, or to their persons, related to participation in the Contest; or arising out of any violation of rights of publicity or privacy, or claims of defamation or portrayal in a false light; or based on any claim of infringement of intellectual property or other rights; or from any typographical, human or other error in the printing, offering, selection, operation or announcement of any Contest activity and/or prize). Without limiting the generality of the foregoing, entrant agrees that Released Parties: (a) have neither made nor will be in any manner responsible or liable for any warranty, representation or guarantee, express or implied, in fact or in law, in connection with the Contest and/or with respect to the prize, including, without limitation, to any prize’s quality or fitness for a particular purpose; (b) maintain no control over the personnel, equipment or operation of any air, water or surface carrier, ship line, bus or limousine company, transportation company, hotel, manufacturer or other person or entity furnishing services, products or accommodations (“Suppliers”) as a part of the prize provided in connection with the Contest; and (c) will not be responsible or liable for any injury, damage, loss, expense, accident, delay, inconvenience or other irregularity that may be caused or contributed to: (i) by the wrongful, negligent or unauthorized act or omission on the part of the Suppliers or any of their agents, servants, employees or independent contractors, (ii) by any defect in or failure of any vehicle, equipment, instrumentality, service or product that is owned, operated, furnished or otherwise used by any of those Suppliers, (iii) by the wrongful, negligent or unauthorized act or omission on the part of any other person or entity not an employee of the Released Parties, and (iv) by any cause, condition or event whatsoever beyond the control of the Released Parties. Entrant further agrees to indemnify and hold harmless Released Parties from and against any and all liability resulting or arising from the Contest and to release all rights to bring any claim, action or proceeding against Released Parties. Sponsor is not responsible for the actions of entrants in connection with the Contest, including entrants’ attempts to circumvent the Official Rules or otherwise interfere with the administration, security, fairness, integrity or proper conduct of the Contest. 12. Publicity Release. Subject to applicable law, the Winner irrevocably grant the Released Parties and each of their licensees, and its and their successors, assigns and sub-licensees the right and permission to use their name, voice, likeness and/or biographical material for advertising, promotional and/or publicity purposes in connection with the Contest, in all forms of media and by any and all means and media (now and hereafter known), and on and in connection with related products, services, advertising and promotional materials (now known or hereafter developed), worldwide, in perpetuity, without any obligation, notice or consideration except for the awarding of the prize to the Winner. 13. Suspension / Modification / Termination. In the event Sponsor is prevented from continuing with the Contest by any event beyond its control, including, but not limited to, fire, flood, epidemic, earthquake, explosion, labor dispute or strike, act of God or public enemy, communications or equipment failure, utility or service interruptions, riot or civil disturbance, terrorist threat or activity, war (declared or undeclared), interference with the Contest by any party, or any federal, state or local government law, order, or regulation, order of any court or jurisdiction, or other cause not reasonably within Sponsor’s control (each a “Force Majeure” event or occurrence) Sponsor shall have the right to modify, suspend or terminate the Contest. Sponsor additionally reserves the right, in its sole and absolute discretion: (a) to modify, suspend or terminate the Contest should causes beyond Sponsor’s control corrupt or interfere with the administration, integrity, operation, security or proper play of the Contest; or (b) to disqualify any entrant found to be, or suspected of: (i) tampering with the entry process or the operation of the Contest; (ii) acting in violation of these Official Rules; or (iii) acting in an un-sportsmanlike manner. The Released Parties are not responsible for any changes or unavailability of the Contest Site used for purposes of administering this Contest that may interfere with the Contest (including any limitations, any restrictions, or any conditions on Sponsor’s ability to use the Contest Application Site for the Contest as set forth herein that are not acceptable to Sponsor) or ability of entrant to timely enter, receive notices or communicate with Sponsor via the Contest Application Site, in which case Sponsor, in its sole discretion, may terminate or modify the Contest. 14. Governing Law / Limitation of Liability. All issues and questions concerning the construction, validity, interpretation and enforceability of these Official Rules or the rights and obligations of entrants, Sponsor or the Released Parties in connection with the Contest will be governed by and construed in accordance with English law, without giving effect to any choice of law or conflict of law rules or provisions that would cause the application of any other laws. 15. Dispute Resolution. The parties each agree to finally settle all disputes only through arbitration; provided, however, the Sponsor shall be entitled to seek injunctive or equitable relief in the state and federal courts in Los Angeles County, California and any other court with jurisdiction over the parties. In arbitration, there is no judge or jury and review is limited. The arbitrator’s decision and award is final and binding, with limited exceptions, and judgment on the award may be entered in any court with jurisdiction. The parties agree that, except as set forth above, any claim, suit, action or proceeding arising out of or relating to this Contest shall be resolved solely by binding arbitration before a sole arbitrator under the streamlined Arbitration Rules Procedures of JAMS Inc. (“JAMS”) or any successor to JAMS. In the event JAMS is unwilling or unable to set a hearing date within fourteen (14) days of the filing of a “Demand for Arbitration”, then either party can elect to have the arbitration administered by the American Arbitration Association (“AAA”) or any other mutually agreeable arbitration administration service. If an in-person hearing is required, then it will take place in Los Angeles, California. The federal or state law that applies to these Official Rules will also apply during the arbitration. Disputes will be arbitrated only on an individual basis and will not be consolidated with any other proceedings that involve any claims or controversy of another party, including any class actions; provided, however, if for any reason any court or arbitrator holds that this restriction is unconscionable or unenforceable, then the agreement to arbitrate doesn’t apply and the dispute must be brought in a court of competent jurisdiction in Los Angeles County, California. Sponsor agrees to pay the administrative and arbitrator’s fees in order to conduct the arbitration (but specifically excluding any travel or other costs of entrant to attend the arbitration hearing). Either party may, notwithstanding this provision, bring qualifying claims in small claims court. 16. No Obligation to Use. Sponsor shall have no obligation (express or implied) to use any or to otherwise exploit any Submission or, if commenced, to continue the distribution or exploitation thereof, and Sponsor may at any time abandon the use of the Submission for any reason, with or without legal justification or excuse, and entrants shall not be entitled to any damages or other relief by reason thereof. 17. Dates & Deadlines/Anticipated Number of Entrants. Because of the unique nature and scope of the Contest, Sponsor reserves the right, in addition to those other rights reserved herein, to modify any date(s) or deadline(s) set forth in these Official Rules or otherwise governing the Contest. Sponsor cannot accurately predict the number of entrants who will participate in the Contest. 18. Further Documentation. If Sponsor shall desire to secure additional assignments, certificates of engagement for the Submission or other documents as Sponsor may reasonably require in order to effectuate the purposes and intents of these Official Rules, then entrant agrees to sign the same upon Sponsor’s request therefor. 19. Confirmed Contest Winner / Official Rules Requests. To receive any legally required confirmation of the Winner, send a stamped self-addressed envelope to: Wild Brain 3D Printing Contest Winner, Attn: Wild Brain Family International Limited, 146 New Cavendish Street, London, W1W 6YQ within sixty (60) days of expiration of the Entry Period. For a copy of these Official Rules, send a legal-size, self-addressed, stamped envelope to Wild Brain 3D Printing Contest Official Rules, Attn: Wild Brain Family International Limited, 146 New Cavendish Street, London, W1W 6YQ prior to the end of the Entry Period. 20. Identification of Sponsor. This Contest is sponsored by: Wild Brain Family International Limited, 146 New Cavendish Street, London, W1W 6YQ. Reference to third parties in connection with the prize and/or third party websites or services are for reference and identification purposes only and not intended to suggest endorsement, sponsorship or affiliation with Sponsor or the Contest. 21. Information Submitted. As a condition of entering the Contest, entrant gives consent for Sponsor to obtain and deliver his or her name, address and other information to third parties for the purpose of administering this Contest and to comply with applicable laws, regulations and rules. Any information entrant provides to Sponsor may be used to communicate with entrant in relation to this Contest or on a Contest Winner’s list.